Property Handbook Section 2: Utility Equipment - Muirfield Association, Inc.
All utilities originate from easement areas on each lot and are to be underground. Initial installation or repairs may require trenching. If trenching is required through common areas, written approval from Muirfield Association is required before any work can begin. Wiring must be properly buried and the disturbed area completely restored. All service wiring, entries and conduits must enter the home at ground level and may not be exposed on the outside of the house. Mechanical units must be mounted at the rear elevation or side rear elevation of the home and tucked into an inconspicuous location. Meters on the exterior of homes and other mechanical equipment must be painted to match the house and screened from street and neighboring views with evergreen plant material for year-round coverage. 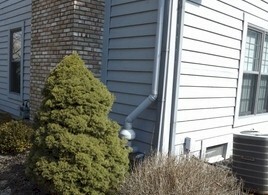 In the case of radon mitigation units, the external pipe must terminate no more than 18” above the roofline and be below the ridgeline of the home. Window air conditioning units are prohibited. To install a satellite dish, a completed Notice of Installation form must be approved and on file at the Association office. Owners and residents must adhere to the rules and regulations regarding the installation of this type of antennae equipment. The installation must be in compliance with FCC regulations, local building and safety codes as well as in accordance with the instruction of the manufacturer. To preserve the integrity of the Muirfield concept, all installations must be as unobtrusive as possible. Exposed wiring on the exterior of the home must be kept to a minimum. Should any part of the dish, mast or wiring be visible from the street, golf course or neighboring home or lot, it must be painted to match the color of the structure they are adjacent to or attached to unless otherwise camouflaged, shielded or screened from view. Recommendations for screening include evergreen landscaping materials and imitation rocks (satellite rock covers) as approved by the MDCC. Attic antennae are encouraged. Other exterior TV and radio reception antennae are prohibited.